The platform comes with a default 404 error page or a "page cannot be found" in the system. You can edit this page to your liking by simply clicking on the page like any other page and inserting text or graphics. 404 error pages are pages that load when a page has been linked incorrectly or deleted. 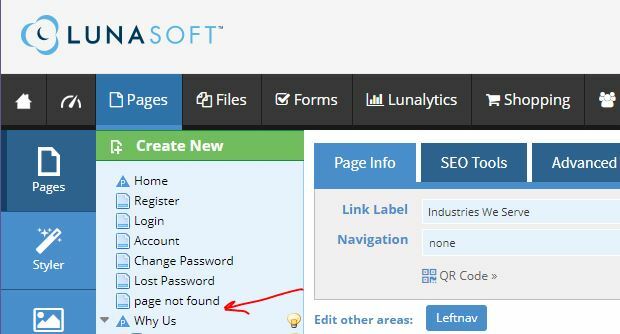 A user will type in a url, click on a link and arrive at a page that does not exist on your site (a missing page). It basically means the site could not find the page. This is an opportunity to bring your visitor to your home page instead of losing traffic. Here is what the page looks like that you can edit.